In 1811, "circuit rider" Elijah Metcalf rode into town on horseback and met with three couples. This is how we started. This group met in homes and continued to reach more people. The first meeting house was built in 1822 near the present Saint Joseph's Church on Main Street. 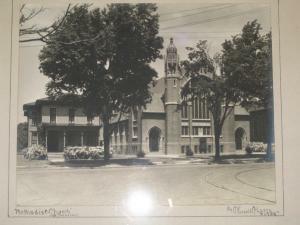 As the congregation continued to flourish, a more imposing structure was built at the corner of Center and Barker Streets in 1839. This was torn down in the 1940's. We have an interesting display of artifacts located in the present office area of our church. Membership continued to increase and a more desirable location was sought. During 1868-1869, the present property at 25 Church Street was purchased and a red brick church was erected by our 140 members for a cost of $30,000. On December 21, 1922, the church was destroyed by fire and work began the following Spring to construct the current English Neo-Gothic-style edifice for $121,000 (its value today is over two million dollars). In 1956, a campaign was held to raise $165,000 and resulted in our building a modern education wing. The mortgage-burning and dedication of this addition took place during our sesquicentennial celebration in 1961. A major renovation of the sanctuary, office, heating system, and kitchen occurred and was topped off by the dedication of our new Schlicker pipe organ in 1970-1971. More recently, in 2006, we enjoyed an ecumenical worship service as we joined with our Baptist neighbors next door as we replaced the the sanctuary roof. Work continued in 2008 with the completion of the new windows for the education building and the start of the refurbishment of the stained glass windows. This is a four year project. Today, we are a church with an emphasis on being connected to our community. Numerous groups call our building home. Our mission team sends groups as far as Biloxi, Mississippi, but also works on homes in the Fredonia and Dunkirk area, and has put in well over a thousand person-hours in Silver Creek and Gowanda, NY, and the surrounding communities following the 2009 flooding. Our blended style worship has a little something for everyone, with the lively sound of our Praise Team, the soaring sounds of our Chancel Choir, and the majestic Schilcker organ. Worship incorporates sight and sound, and aids the visually and hearing impaired, through the use of multimedia. God has always called His people to overflow, not to be contained. The vision for ministry for First United Methodist Church of Fredonia is a vision of overflowing ministry — to the lives of people within our walls and to those still on the outside. Overflowing ministry begins when we make the right connections. We must be connected to God…to each other…and to our world. Then and only then will our lives and our ministry overflow as God intended. Fulfill a mission in the world." We believe that statement is aligned with the Scriptures, historic Christianity, the Wesleyan spirit of our heritage and the history of First United Methodist Church. Connected to God…to each other…and to our world. But what does that mean in the specifics of our life and ministry together? We envision worship that truly connects us to God. Our God deserves our heartfelt worship. Although worship is frequently commanded in Scripture, it is also an awesome privilege for the people of God. Our worship service is filled with people who are in awe and excited about what God, Jesus Christ and the Holy Spirit have done in their lives. This worship is expressed in many ways to enable all our people to connect with God. For believers, it is our heartfelt response to the greatness of God. For guests, it is an opportunity to develop a connection with God. Provide resources to help people to worship during the week. Be sensitive to the presence of unchurched people in worship. Congregational singing and special music. Different styles and volumes of music. Creating an atmosphere of celebration in worship. Using more frequent up-tempo musical selections. Incorporating spontaneous moments into planned worship. We envision a church warm and welcoming in its fellowship. Hospitality is more than a function of a ministry team; it is the responsibility of all God’s people. We all need to make the effort to help people feel at home when they come to Fredonia First United Methodist Church—whether they are here for the first time or long-term members. Our church will be known for its love for each person God sends our way. We will help people make connections with God and one another. Website should answer basic questions and connect with individuals. Friendly faces will be enhanced by greeting and mentoring. Entryways need to be inviting spaces. Handicapped-accessible for a variety of handicaps, including the vision, hearing, mobility-impaired. Directions to our building and within our building—signage. Personal comfort—food, beverages, and rest rooms. Provide immediate introductions and invitations to come in, join and sit. Invite newcomers to sit with someone familiar with the building and activities of the church. Informal “get to know you” activities should take place in all small groups and throughout the church. Share meals in both large and small groups of people. Periodically offer large group and/or intergenerational activities. We envision a church growing in Christian faith through interaction with Scripture and fellowship with persons of like mind and heart. There will always be people in our church all along the faith spectrum—from seekers to fully devoted followers of Christ. In our journey together, we seek to grow toward maturity in Christ. Assume Christian growth as the expectation, not the exception. We fully expect each of us to grow. We expect that in growing, our faith will make a difference. We recognize the need for a process to encourage growth. At the beginning and throughout that process we will befriend and mentor people to help them connect to an appropriate small group (examples: Bible study, mission or support group). -Prayer, Bible Study, Worship, Obedience. -Memorizing Scripture for internal use. -Stewardship of all our resources. -Walking in the power of the Holy Spirit. +Offering public acts of faith for faithful living—Baptism, Confirmation, Communion, Marriage etc. -Basics of Christian Faith (Alpha and Confirmation, e.g.). -Living a purpose-driven life (text: Purpose-Driven Life). -Discovering and using spiritual gifts. -Bible studies— topical and book studies. +Life application studies and/or discussions, including youth, young adults, marriage, parenting, midlife, seniors. -Mental illness, depression/suicide, grief, conflict resolution ect. +Offer "big growth" events periodically and ministry opportunities. We envision a church expanding its care for one another. At any point in time, there will be persons who are facing serious spiritual and physical needs. Others may struggle to meet the basics of food, clothing and shelter. We will relate to each other like members of a loving family. No one will face a need without the full support of the church. Support the continuation of ministries of care currently in place in the church: visitation to the homebound and persons in various homes or the hospital, prayer chains and prayer groups. Develop a “clearing house” for identifying needs in our congregation and a streamlined process for addressing those needs. Teach people to share their needs with one another in the church family. Expand our prayer ministry by praying for people in need in our Team Meetings. Challenge all of our groups (Ministry Teams, Sunday school classes and other small groups) to minister to their own teammates in times of need. Offer anointing with oil and prayer periodically following worship and at other times. Seek to provide transportation and child care for worship and other church-related events. We envision a church extending its reach in evangelism. The good news of Jesus is for everyone. We will be an inviting church, employing a variety of means to help people form a vital relationship with Jesus. Watch for people who are facing “Windows of Opportunity” in their lives—times when they might be especially open to an invitation to church or to receive Christ—times such as birth, a move, a crisis in their lives, a health issue, job or other major transition. Ask people to write on a 3X5 card the name of persons they know who do not attend any church. Pray for them daily and then invite them to worship and/or another church-related event. Teach people to understand, express and share their testimony of faith in Christ. Give them a simple outline as “pegs” on which to hang their experience to increase their comfort level. Strongly recommend the continuation of our Alpha ministry. We envision a church serving our community and the world. Because we have experienced the love of God in Christ, we serve by sharing our time, energy and resources with others. Understand our role in the world beyond the church building. We are to be salt and light, influencing other people for Christ and taking the good news of the gospel wherever we go. Encourage efforts that are already underway to support our service beyond the church, such as the use of the “matching funds” principle for raising mission dollars through our church. Increase incrementally the direct involvement of the congregation in mission efforts. By 2010, the participation of the congregation in monetary giving and donated time/gifts in kind will equal the Mission Team budget. In 2006, do a one-day Mission team outing at a sponsored site. Invite new participation in the event. In 2007, have a church-sponsored mission trip to a site to be determined. Seek the broad participation of persons in the church through such means as prayer partners, financial support, “materials” support, communication etc. Make use of any creative ideas to involve as many people as possible. Afterward, assess the trip’s effectiveness and determine goals for planning the next mission trip. Invite persons we support in missions to visit and speak at our church to increase awareness among our people. Also, make use of “Minutes for Missions” and multi-media presentations to keep people apprised of what we are doing. God has given us the Scriptures. In the Scripture, God reveals Himself to us. He shows His purpose for our lives individually and as a church. In the Bible we find strength and encouragement for doing the ministry God calls us to do. Prayer connects us with the power of the Holy Spirit and the presence of Christ. When Jesus gave the Great Commission, He promised that He would be with us to the very end of the age. We believe that we can rely on the presence of the risen Christ in the power of the Holy Spirit as we follow the vision. Prayer is essential. It enables us to focus on our purpose and releases the power of God for our ministry. We recommend that we establish a Prayer Ministry Team to help coordinate all our prayer ministries. We urge our Ministry Teams and leaders to practice prayer in their own lives and in their ministries. Prayer at our Team meetings is essential to seeking God’s best for this church. We call upon all our people to make prayer a daily habit in their lives. The people of this church are valued as resources God has given us. We encourage each of us to find a ministry in the church and fulfill a mission in the world, using our God-given spiritual gifts. We will continue to teach, preach and model the ministry of all God’s people, from the pulpit and in all classes. We will make opportunities for service known to our congregation through our various means of communication. We strongly urge our Ministry Teams to find ways to invite uninvolved persons to experience their ministry and determine if God is calling them to that ministry. We recommend a continued inclusion of children and youth in all aspects of fellowship, worship, ministry and mission in the church. God has entrusted our building and facilities to us. We will exercise good stewardship in the best use and care of that trust. We reaffirm the importance of an annual walk-through of the building to determine present and future needs of repair, painting or upgrading. We suggest an annual “building audit” from the perspective of our total ministry. Are there changes we need to make the use of our facilities to better support our ministry needs? We recommend that persons unfamiliar with our building periodically tour it and give us their impressions and suggestions. We need additional and updated signage that coincides with current ministry usage. Also, we should assign names to the rooms. Finances...Provide a further resource for ministry. It has been said that “God’s work, done in God’s way, will never lack for God’s resources.” Funds for the ministries of the church are provided both through regular giving and through special gifts used for ministry. We recommend ongoing teaching and preaching about the stewardship of financial resources. We recommend that financial decisions be made on the basis of the call of God upon us for ministry. We must be sure finances are the servant of ministry and not the other way around. We ask our Finance Ministry Team to regularly report to the congregation the financial state of the church. Staffing…In our church, most of our ministry is performed by lay persons. We believe this is the New Testament pattern for the church. Paid staff positions provide ministries that are not being done by the laity. They come alongside to support the overall ministry of the church. Communication…We commend the use of various forms of communication to promote our mission to our members, friends and the community at large. The bulletin, newsletter, newspaper, website and multimedia are all tools to get the word out. But we believe word of mouth is the best form of communication. We encourage our people to promote their church and its mission. We suggest that all communications be positive and welcoming. We recommend that all forms of communication be evaluated periodically. We recommend that a group of persons be named as “keepers of the vision,” to bear the responsibility of keeping us on track toward the vision we believe God has given us for First United Methodist Church. However, the implementation of this vision will come through the ongoing work of our Ministry Teams. It is the strong belief of the Strategic Planning Task Force that the best days of this church are still in the future. We hear God’s word to Jeremiah and take it as our own word of encouragement: “I know the plans I have for you, declares the Lord, plans to prosper you and not to harm you, plans to give you a hope and a future.”(Jeremiah 29:11). May the future find First United Methodist Church of Fredonia still about the business of helping to connect people to God, to each other and to our world!!! We must be connected to God…to each other…and to our world.